Who loves snow sports? Well in Ski Sim Cartoon you have your choice. 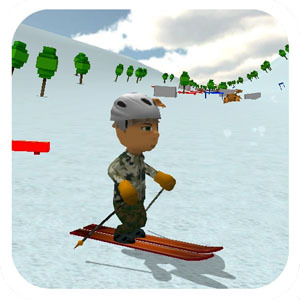 Hit the slopes with your choice of character and choice of snow sports equipment. If you love to snowboard, ski, bobsled we have them all covered. Choose which you want and start with the easy level 1. As you progress the level get more difficult with more obstacles in the way. You can jump over them or simply avoid them while going down the ski slope. it’s your choice. Can you finish all levels and get to the finishing line? Arrow keys to move. Space bar to Jump. A cool jigsaw puzzle with three different takes and variations on the famous Mona Lisa painting. Aquatic Parks are so funny! Who doesn’t like sliding in a slope while receiving water splashes in her face. What type of swimming suit would you wear? You will be inspired in this game it will give you some ideas! He’s a long, long way from home. How will he get back to planet Earth? Dodge falling bricks in this fun multitasking game! Analyze your power of observation by finding out the numbers which is on the image. For each accurate click, score will get increased and for wrong click, score will get reduced. This Neanderthal’s going clubbing. Dino clubbing.